JNN 25 Feb 2015 Tripoli : More than 40 people were killed and 70 injured in car bomb explosions in the eastern Libyan city of Qubbah (El Gubba, Quba) on Friday, parliamentary speaker Aguila Saleh said. Saleh told Al-Arabiya television the car bombs had targeted a petrol station next to a security building. Qubbah is Saleh’s hometown. The pan-Arab news channel Al-Jazeera earlier said at least 13 people had been killed in three explosions. Reuters was not immediately able to get confirmation or details from Libyan officials. On Monday, Egypt launched airstrikes on suspected ISIL (Islamic State in Iraq and the Levant) terrorist group targets; a day after the group released a video showing the execution of Egyptian Coptic Christian workers. Libya is in chaos, with two governments and parliaments vying for legitimacy and territory four years after Muammar Gaddafi was toppled. Two bombs have gone off outside the residence of the Iranian ambassador in the Libyan capital, Tripoli, causing minimum damage to the empty building. 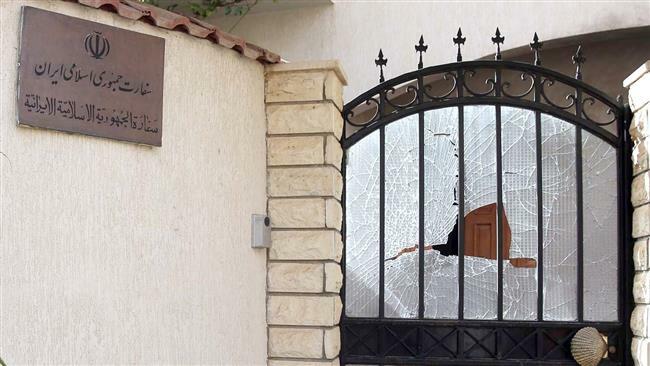 One bomb exploded outside the security gate and a second was lobbed into the grounds of the residence, a spokesman for security services in Tripoli, Issam al-Naass, told AFP. According to reports there have been no casualties as a result of the blasts. Iran has not posted a permanent diplomat in Libya due to ongoing unrest in the North African country. ISIL Takfiri terrorist group has reportedly claimed responsibility for two bomb blasts against the residence of the Iranian ambassador in Tripoli. That is according to a statement in Twitter by ISIL loyalists. Meanwhile, two car bombs have struck near the Egyptian and United Arab Emirates embassies in Libya’s militia-controlled capital Tripoli, according to multiple sources. Two guards posted outside the empty Egyptian embassy compound were wounded in Thursday’s first blast, Libya’s LANA news agency reported. Three more posted outside the empty UAE compound were wounded in the second, a senior UAE official told AFP in Abu Dhabi. Both governments are considered hostile by militias who seized Tripoli in August in an offensive during which UAE fighter jets allegedly carried out strikes against them from neighboring Egypt. Abdullah bin Zayed Al-Nahyan, UAE foreign minister, denounced the attack against his country’s embassy as a “terrorist act” and blamed it on Fajr Libya (Libya Dawn) and Ansar al-Sharia (Partisans of Islamic Law). The U.S. has blacklisted Ansar al-Sharia as a terrorist group for its alleged role in a deadly 2012 attack on the U.S. consulate in the eastern city of Benghazi, where it is largely in control. Fajr Libya is a coalition of extremist militias who seized Tripoli in August after weeks of deadly fighting with a nationalist group. Nahyan, in a statement carried by state news agency WAM, said the bombing “badly damaged” the embassy and wounded three people in the area. The recognized government’s Foreign Ministry said such attacks were the result of “the absence of the legitimate state in Tripoli, now in the hands of Islamist militias which use the threat of arms against citizens, public institutions and diplomatic missions”. A Libyan security official, who works for a unit in charge of protecting embassy and diplomatic staff, said police were investigating the bombing and studying footage from CCTV cameras. He also linked the attacks to “support” by the governments of Egypt and the UAE for Khalifa Haftar, a former general who has launched an offensive on extremist militias in Benghazi. “This is not the first time that the embassies of those two brotherly countries are targeted … due to their continued support for Haftar’s forces,” he said. On April 23, 2013, a car bomb hit France’s embassy in Libya (below), wounding two French guards and a Libyan teenager and causing extensive damage. The Libyan Foreign Ministry branded the bombing a “terrorist act”, and French President Francois Hollande said Tripoli must act quickly to find the perpetrators and bring them to justice. On January 17, 2015, assailants lobbed explosives at Algeria’s embassy in the Libyan capital, wounding three people, a security official said, in an attack claimed by the ISIL Takfiri terrorist group. The oil-rich country has been witnessing numerous attacks against foreign embassies since the unrest began in the country. The Foreign Ministry in Egypt, which has denied participating in the raids, also denounced Thursday’s “terrorist bombings”. Egypt closed its embassy in Tripoli in January and the UAE followed suit in May as security conditions in the city deteriorated. Three years after Muammar Gaddafi was toppled and killed in a NATO-backed revolt, Libya is run by rival governments and parliaments. While the conservative factions have set up their own government and parliament in Tripoli, the elected parliament and administration of Prime Minister Abdullah al-Thinni has been compelled to operate out of Tobruk. Both sides have routinely accused each other of seeking support from neighboring regional powers, and many embassies and embassy staff have left Tripoli. International efforts led by the UN to mediate between the rival factions have so far failed to broker a ceasefire or bring the main armed actors to the negotiating table. The clashes among the rival militants, who had participated in the anti-Gaddafi uprising, are mainly over the control of oil facilities in eastern Libya. Libya plunged into chaos following a 2011 uprising against the dictatorship of Muammar Gaddafi. The ouster of Gaddafi gave rise to a patchwork of heavily-armed militias and deep political divisions. This entry was posted in AFRICA, Iran News, Middle East and tagged Algerian, Egyptian Embassy, French Embassy, Irani Embassy, Libya, Muammar Gaddafi, UAE Embassy. Bookmark the permalink.